On the afternoon of 24 July, people taking shelter at a United Nations school in Beit Hanoun gathered in the yard to evacuate. Minutes later a barrage of Israeli artillery shells crashed into the school killing sixteen people and wounding 200. The Israeli army claimed it had given evacuation orders whileUN spokesperson Chris Gunness insisted that the UN had called for a lull in the fighting to facilitate evacuation. It was the fourth time Israel hit a UN facility since it began its assault. On 27 July the people of Gaza had a reprise from bombardment. They began sifting through the piles of rubble, searching for the dead. Surrounded by the smell of death, they uncovered another one hundred and fifty bodies. Others searched for the remnants of their biographies: their books, their artworks, their papers. These are but a few of the scenes of Gaza 2014. They are painful in their immediacy. But their familiarity is also a source of injury. They do not belong to this time or this place alone. They are instances in what is now a century-long confrontation with colonialism. They are part of an archive that is the Palestinian condition. In the immediate present, to live in Gaza is to live in perpetual search for refuge. Gaza today belongs to the archive of colonialism. The scenes from Gaza conjure formative catastrophes, like those of 1948 when eighty percent of Palestine became Israel; when Zionists forces destroyed or depopulated over four hundred villages; when 800,000 Palestinians became stateless refugees denied their internationally recognized right to return; when 150,000 Palestinians in what was now Israel became “present-absent” strangers on their own land. The scenes from Gaza conjure instances of indiscriminate death at the hands of a superior military force, often acting under the guise of retaliation, and always enacting collective punishment. They conjure the Qibya massacre of 1953 when a young Ariel Sharon killed sixty-nine residents and reduced forty-five homes to rubble. They conjure Sabra and Shatila in 1982 when the Israeli army shelled the refugee camps and lit the way for Lebanese Phalangists to “mop up” the Palestinians inside. The scenes from Gaza conjure other more mundane moments: house demolitions, land expropriations, targeted assassinations. Israel’s most recent incursion has resulted in the designation of forty-four percent of the Gaza Strip’s land as a “buffer zone.” This is a historical repetition of the Israeli strategy of land expropriation that has aimed at and resulted in an ever-shrinking Palestine. For the Palestinians living under occupation in the West Bank, for the Palestinians living in Israel, for Palestinian refugees, for the Palestinians in diaspora, the sight of exodus, of displacement, of grief, and of searching for refuge is not singular. It is but another instance of historical repetition in the confrontation with Zionism, that has with all of its technologies and adaptations continued its conquest of land and everything that this conquest necessitates: most crucially the erasure of the Palestinians. Gaza today belongs to the archive of colonialism. On July 2, Israeli police found the tortured and burnt sixteen-year-old body of Mohammed Abu Khudeir in a Jerusalem forest. Six young Israelis had kidnapped him on his way to prayer, forced him to drink gasoline, and lit him on fire. Those one and a half million people subjected to the injurious and colonial label “Israeli Arab” took to the streets from the south in the Naqab to the north in Haifa. Throughout the non-contiguous bantustans of the West Bank, Palestinians rose up. On both sides of the green line that partitions historic Palestine, there were pitched battles with Israeli forces. One side threw rocks. The other side threw tear gas, rubber coated bullets, live fire, and toxic water called “skunk.” It was hard to distinguish between Nazareth and Ramallah, between Tulkarm and Baqa. These uprisings do not belong to today alone. They belong to the rebels of 1936-1939 who for a brief moment liberated the cities of Palestine from British rule; to the fida’iyin of the Palestinian revolution in the 1960s and 1970s; to the strikers and marchers who stood up against land confiscation inside Israel on Land Day in 1976; to the revolutionaries of the first intifadawho faced brutality with civil disobedience; to the stone throwers whose time in Israeli prisons became rites of passage. Gaza today belongs to the other part of the archive that is the Palestinian condition, the archive of decolonization. In launching its military experiment on its favorite laboratory, the Gaza Strip, Israel banked on historical repetition and delivered it as the Palestinian death toll mounts. In return, the Palestinians have delivered historical rupture. For the first time since 1993, the Palestinians insisted to the many forces much stronger than them that they would not fall prey to the logic of agree now, negotiate later. They refused the choice between slow or immediate death anddemanded an end to the siege of Gaza. In contradistinction to Israel’s last two last assaults on Gaza, Hamas inflicted higher costs than ever before on Israel’s far superior military power, killing (at the time of this writing) fifty-six soldiers, two Israeli civilians and one Thai national. Previously narrating Hamas as irrational and irrelevant, Israeli commentators now faced Hamas’ steadfastness in the face of a devastating power imbalance. That steadfastness has, if only momentarily, shifted the terms of political discourse, across Palestinian political factions, from the swamp of “negotiations” to a revitalized focus on resistance. Gaza today is also a rupture in the historical record. Read other posts in this week-long blog series featuring views on the intensification of the Israeli-Palestinian conflict. And in response, Palestinians—once again and across their territorial separations—took to the streets. On the evening of 24 July and in the thousands, they braved live fire and rubber coated bullets. In Ramallah they marched to Qalandia. In Nablus, they marched to Hawara. In Hebron, in Bethlehem, in Tulkarm they confronted Israeli forces. In the Jerusalem suburb of Abu-Dis, young men chipped at the Wall. The symbolic destination was Jerusalem. The concrete outcome was a refusal to submit, a rejection of bifurcation. To designate these mobilizations as “pro-Gaza” is to misread history. Of course these Palestinians stand with Gaza. But they understand Gaza as part of their reality, as part of their ongoing confrontation with colonialism. They seize the rupture and they demonstrate for Gaza; and also for Palestine, beyond, before, across Israel’s machinations of separation. At the time of this writing [July 31], the Israeli military machine has killed 1,463 Palestinians and injured over 8,400. In the face of this tremendous loss, it is counterintuitive to ponder accumulation. Yet we can reflect on the last twenty-four days, as the latest instance of historical accumulation. 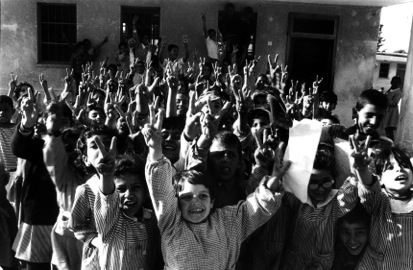 “Tomorrow I Will Be Fine.” Palestinian students at the UNRWA school in Canada Camp, Rafah, 1988. Image by Randa Shaath. At the thin intersections of popular memory and archival practices lie the stories that people tell to make sense of the everyday. They weave these stories to shape the present, build connections to the past, and stake claims for the future. They draw on continuities. They distinguish ruptures. They attend to that pit of possibility and danger that is historical contingency. They sift through repetition to identify the singular, the new. And they build and nourish an archive: one that keeps a record of colonization and guards the will to decolonize. Gaza today, in its continuities and its ruptures, is an instance of the archive that is the Palestinian condition.